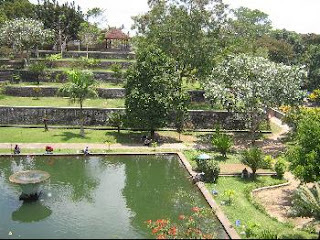 Taman Narmada, 11 kilometers east of Mataram, was built in 1727 by King Anak Agung Gede Ngurah Karang Asem as both a pleasure garden and place to worship Shiva. Its big pool is said to represent Segara Anakan, the crater lake on the volcano Rinjani where they used to make offerings by throwing valuables into the water. As he became too old to make the pilgrimage up the 3,726 meter high mountain, he had Narmada made to represent the mountains and the lake. Near the pond is a place of worship and a spring whose water is believed to give dedicated pilgrims eternal youth.